I am finally in full holiday spirit! With some colder weather, shopping, spending time with friends and family, and eating my face off with Christmas cookies, it's hard not to feel the cheer. I hope you are enjoying your holiday season as well! So cute! Love the tee over the plaid! Your pup is adorable too. Merry Christmas! 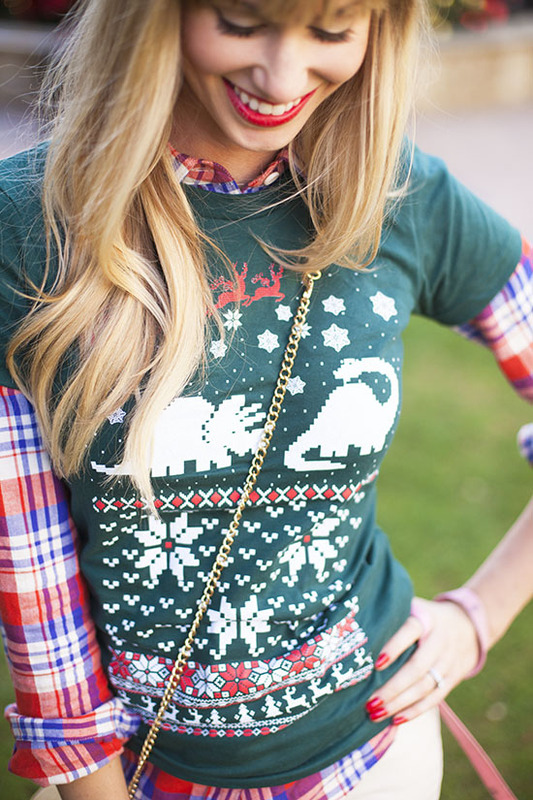 Love how you paired the plaid shirt with the tee - so cute! Love that shirt with the dinosaurs! Too cute! What an adorable outfit and puppy! Aww I remember your dog as just a puppy! Lovely outfit! I love the sweater with the plaid shirt, and your boots also, very very cute! Adorable! I totally love this! Oh my gosh this is so cute! Love it! Aww this puts a smile on my face where one has not been all weekend. Thanks for spreading some much needed cheer! 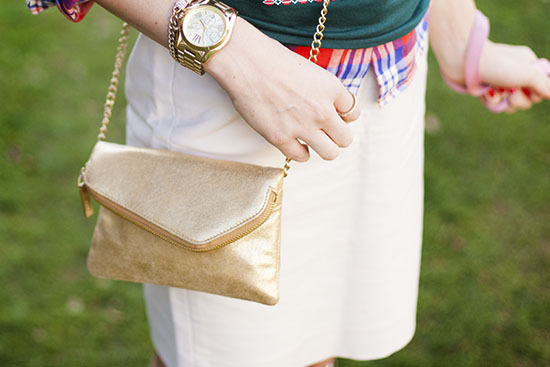 I love the layering in this post! love the tee with the plaid and love the DIY sign!! so cute! you always look adorable! and your doggie is sooo cute!!! These pics are so cute! Your whole outfit is putting me in the Christmas spirit! This really couldn't be any cuter (or more festive) - love the layered shirts and your skirt + boot combination...totally adorable! what an adorable outfit. :) and I can't believe your dog left those antlers on!! That is the perfect Christmas outfit- love it! I love the outfit. 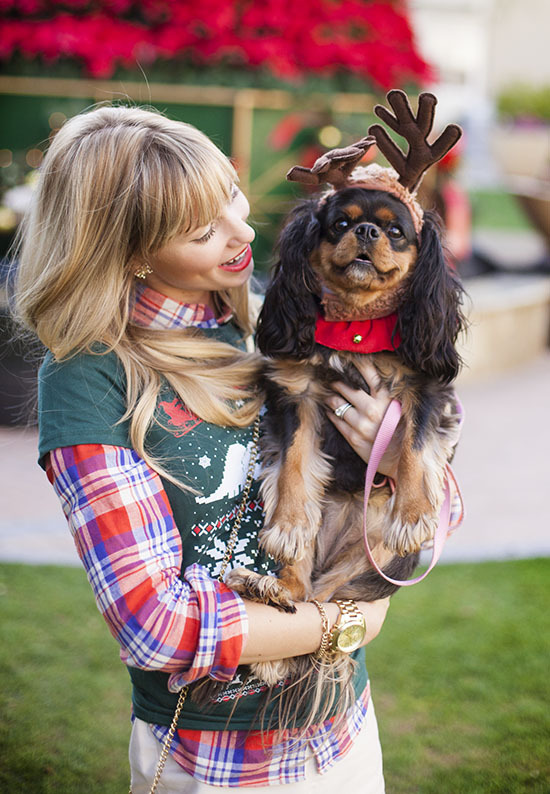 Adorable for the holidays! This is ADORABLE! Such a beyond perfect holiday outfit, and the photos themselves are too cute! Love it. Absolutely adorable Katie! Love everything about these pics and the outfit! 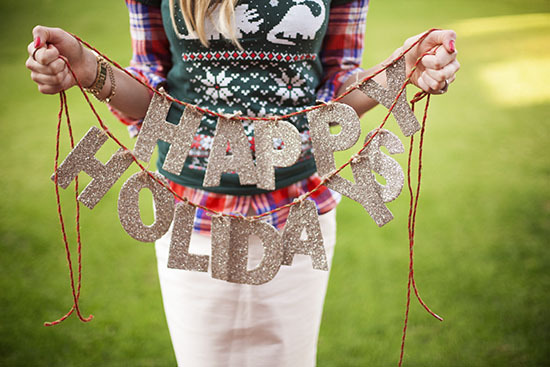 LOVE this outfit, one of my favorites of yours for the holiday season!